This volume presents a unique interdisciplinary approach, drawing on expertise in both the natural and social sciences. 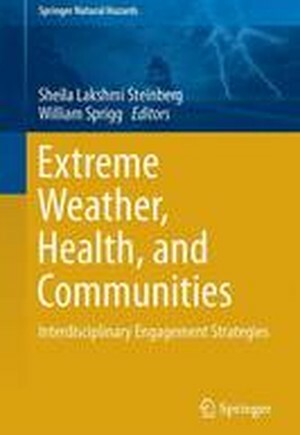 A primary goal is to present a scientific and socially integrated perspective on place-based community engagement, extreme weather, and health. Each year extreme weather is leading to natural disasters around the world and exerting huge social and health costs. The International Monetary Fund (2012) estimates that since 2010, 700 worldwide natural disasters have affected more than 450 million people around the globe. The best coping strategy for extreme weather and environmental change is a strong offense. Communities armed with a spatial understanding of their resources, risks, strengths, weaknesses, community capabilities, and social networks will have the best chance of reducing losses and achieving a better outcome when extreme weather and disaster strikes. Introduction.- Extreme Weather and the World.- The Purpose of the Book.- The Power of "Interdisciplinary".- Superstorm Sandy: a Game Changer?.- Introduction.- New Jersey at a Glance.- Historic Mid-Atlantic Storms.- Tropical storms and hurricanes.- Nor'easter.- Historic storms.- Recent storms.- Sandy's Fury.- Genesis and early days.- New Jersey prepares.- New Jersey in the cross hairs.- Storm day: Monday morning.- Storm day: afternoon.- Storm day: evening landfall.- Sandy's Aftermath.- Lessons learned.- Seemingly slight differences can have major consequences.- Storm conditions do not change at a steady pace.- Storms stronger than Sandy are within the realm of possibility.- Do not fully rely on storms of the past to provide a look to the future.- Heed weather forecasts.- Regional infrastructure is too vulnerable in severe storm conditions.- Messaging needs improvement.- Do not rely solely on lessons from Sandy.- Conclusion - A Game Changer?.- Extreme Weather: Politics and Public Communication.- Introduction.- Blizzards Bring Cooperation.- The Interconnectedness of U.S. Government Agencies.- Politics and Extreme Weather: Historical Context.- New York City.- Chicago.- Denver.- Fort Worth.- Extreme Weather Campaign/Political Influences.- Tornadoes and Politics.- Contemporary Public Communication Methods: The Role of Social Media.- Public Communication Theories.- Knowledge Gap Theory.- Uses and Gratifications Theory.- Conclusion.- Best Practices for Extreme Weather Communication.- Dust Storms, Human Health and a Global Early Warning System.- Global Dust-Health Early Warning System (D-HEWS) - The Motive.- Meningitis.- Asthma.- Valley Fever.- Interviews with Valley Fever Sufferers.- Acquired Insights for a Valley Fever Early Warning System.- This Chapter's Focus on Airborne Dust and Human Health.- The Dust-Health Challenge.- Dust-Health Early Warning System - The Means.- Atmospheric Dust Modeling.- Model Forecast and Simulation Verification.- Satellite-based Remote Sensing.- Surface-Based Remote Sensing and In-Situ Observations.- Upward Looking Remote Sensing.- In-Situ Dust Measurements and Monitoring.- Global Partners in Public Health Applications: Dust-Health Early Warning System - The Opportunity.- A Conceptual Framework.- Global Dust Movement.- Regional and Local Dust Exposure.- Transdisciplinary Information Exchange (TIE).- Implementation.- Conclusions: Best Practices in Technology Transfer, Capacity Building, Training and Education.- Interdisciplinary Engagement of People and Place around Extreme Weather.- Introduction.- Extreme Weather and Changing Patterns.- Religious Leaders Note Environmental Changes.- Extreme Weather and Places.- Extreme Weather Community Health Model.- Description of Extreme Weather Community Health Model.- Model Flow.- Extreme Weather Interdisciplinary Community Engagement.- What is engagement?.- Why Interdisciplinary?.- Place.- Sociospatial Strategies for Place-Based Policy.- Understanding People Community/Culture.- How Context (Space or Proximity) Influences Outcome.- Knowledge about the Local Environment.- Geographies and Community Type.- Importance of community engagement.- Interdisciplinary Teaming for engagement.- Place-based Interdisciplinary Approaches for Extreme Weather Engagement.- Navigating local geographies.- Interaction, Establish Consistent & Ongoing Interaction.- Know your Culture/Community.- Understand General Population and Sub-populations.- Establish Trust.- Engage Using Interdisciplinary Teams with Different Sectors of the Community.- Create Two-way Place-Based Communication.- Choosing A Reasonable Plan for Stakeholders.- Conclusion.- Engaging Communities to Assess the Health Effects of Extreme Weather in the Arctic.- The Setting: The physical landscape.- Climate Change in Alaska: Observed and Expected Changes.- Rising Temperatures.- Warming Oceans.- Decreased Freshwater Ice and Snow Cover.- Thawing Permafrost.- Changes in Extremes.- The Setting: The cultural landscape.- Climate Change, Health Impacts on Arctic Communities.- Findings and Strange Weather Patterns.- Threats to Local Lifestyle.- Changing Food Sources.- Environmental Changes/Challenges to Health.- Conclusions.- Refining the Process of Science Support for Communities around Extreme Weather Events and Climate Impacts.- Introduction.- Community and Understanding a Place.- Challenges of Scientists' Community Engagement for Adaptation.- Variety of environmental change signals.- Changing Louisiana Environments.- Community responses.- Research Methods.- Community Background.- Adaptation Collaboration.- Participatory Action Research (PAR).- Science and Traditional Ecological Knowledge (Sci-TEK).- Effective Engagement Strategies.- First Peoples' Conservation Council (FPCC) 2012.- Community Observations and Stories about Changing Environments.- A Scientists' Perspective.- Changing Environments/Changing Food Sources.- Observations on Health and Changing Environments.- A Proposal for Collaboration Going Forward: Climate Change, Regional Science and Community Task Forces.- Value of Co-Location.- Preparation of participants - scientists and community residents.- Content of science shared and scenario planning.- Using Stories for science communication.- Conclusions and Lessons Learned: How to Engage Effectively with Communities.- Establish Different Types of Collaboration.- Build Capacity through Collaboration.- Create Collaborations Now.- Increase Capacity/Mitigate Vulnerability to Extreme Weather.- Build Collaboration on Trust and Time.- Share Collaboration Strategies with Scientists.- Embrace Different Knowledge Types.- Embrace Action Research Models.- Acknowledgement.- Reducing Vulnerability to Extreme Heat through Interdisciplinary Research and Stakeholder Engagement.- Introduction.- Extreme heat vulnerability: an interdisciplinary perspective.- Vulnerability.- Interdisciplinary research on extreme heat: the SIMMER project.- Stakeholder engagement.- Stakeholders' knowledge, attitudes, and practices with regard to extreme heat in Houston.- Stakeholder Identification.- The Online Stakeholder Survey.- Extreme Heat Preparedness and Response in Houston: Co-production of Knowledge.- Disseminating Research Results to Stakeholders.- Summary and Best Practices for Stakeholder Engagement.- Decision-Maker Engagement.- Dual Engagement Approach.- Early Stakeholder Involvement.- Stakeholder Adaptive Capacity.- Relevance to Local Needs.- Sociospatial Modeling for climate-based emergencies: Extreme Heat Vulnerability.- Introduction.- Social Vulnerability.- Age.- Education.- Income.- Physical Vulnerability.- Heat Vulnerability.- Micro-UHI.- Built-up environment.- Vegetation.- Temperature Warnings.- Social-Spatial vulnerability.- Social Vulnerability Index (SoVI).- Extreme Heat Vulnerability Index.- Statistical Modelling.- Heat Contributing Mortality Causes.- Principal Component Analysis Findings.- Chicago Heat Wave.- Data Hindrance.- Satellite Data.- Mitigation Practices - How to use Vulnerability models to improve health.- EHVI Mitigation Examples - Practiced and Theoretical.- Cooling Center Assessment.- Climate Region Considerations.- Residences.- Concluding Remarks.- Preventative Practices to reduce Heat impacts on Community Health.- Heat mitigation is multidisciplinary.- Heat waves are a local phenomena.- Heat wave vulnerability evolves with the population and location.- Mitigation is a local problem and requires local response.- Drought and Health in the Context of Public Engagement.- Introduction.- What is Drought?.- Drought Impacts.- Water Quality and Water Quantity Impacts.- Mental Health and Stress Impacts.- Dust and Windblown Agents.- Wildlife Intrusion.- Drought Risk Management.- Droughts and Climate Change.- Engagement Strategies.- Community Capitals Framework.- Drought Scenario Exercises and Tournaments.- Case Study: Greater Horn of Africa.- Case Study: Community Capitals Framework and Drought Impact Assessment.- California.- Case Study: Missouri River Basin.- MRB RDEWS Tribal Activities.- Conclusions.- Extreme Weather: Mental Health Challenges and Community Response Strategies.- Introduction.- Extreme Weather and India.- Extreme Weather and Mental Health.- Impacts of Extreme Weather Events on Communities.- Floods.- Cyclones.- Drought.- Displacement due to Extreme Weather Events.- Extreme Weather Events and Community Engagement.- Best Practices for Extreme Weather Community Engagement.- Enhancing Preparedness, Reducing Vulnerabilities and Building Resilience.- Importance of Early Warnings, Timely Evacuation, and Emergency Planning.- Creating Awareness through Interdisciplinary Teaming.- Knowledge Sharing.- Land use planning.- Regional Cooperation.- Best Practices for Mental Health Care.- Extreme Winter: Weaving Weather and Climate into a Narrative through Laura Ingalls Wilder.- A Famous Mid-American Author.- Setting the Stage for the Hard Winter.- Overview of the Hard Winter of 1880-1881.- Meteorological Causes and Context of the Hard Winter of 1880-1881.- Climate Patterns During the Winter of 1880-1881.- Pioneers and Modernistas: Information and Impacts Then and Now.- Vulnerability during Extreme Winter Weather.- Narratives and Stories as a Communication Tool.- The Wilder Weather Narrative.- Testing the Wilder Weather Narrative.- Moral of the Story.- Best Practices: Using Narratives for Weather and Climate Engagement.- The Air We Breathe: How Extreme Weather Conditions Harm Us.- The Connection Between Extreme Weather and Health.- Airborne Particulates.- Role of Gaseous Pollutants.- Geographical Concerns.- Air Pollution and Respiratory Disease.- Air Quality and the Immune System.- Climate and Extreme Weather and Health.- Community Engagement Strategies.- Strategies for Future Health Communication.- Human Response to and Consequences of the May 22, 2011, Joplin Tornado.- Introduction.- Background.- Health and Safety Impacts.- The NIST Investigation.- Chapter Overview.- Data Collection and Analysis using Spatially Integrated, Multidisciplinary Methods.- Introduction.- Tornado Wind Field.- Design Practices and Building Damage.- Fatalities and Injuries.- Emergency Communications and Public Response.- Summary.- Analysis and Results of Fatalities/Injuries and Discussion of Health and Safety Impacts.- Fatalities that Occurred Outside of Buildings.- Spatial Analysis.- Fatalities that Occurred Inside of Structures.- Critical Buildings.- Commercial Buildings.- Residential Buildings.- Summary.- Conceptual Model of Protective-Action Decision-Making; A Path to Best Practices.- Protection is Unnecessary.- Unawareness.- No Personal Risk Perceived.- Protective Action is Necessary.- Recommendations and Future Work.- Best Practices and Recommendations for Human Health and Community Engagement.- Future Research.- Overall Summary.- Approaches for Building Community Resilience to Extreme Heat.- Introduction.- Understanding vulnerability to extreme heat.- Health risks from extreme heat.- Individual and community level factors that increase vulnerability.- Role of Space and Place.- Vulnerability associated with climate change, heat and air quality.- Adapting to the health impacts of climate change.- Actions to protect people from extreme heat events.- Health Canada's approach to increasing heat-health resiliency and preparing Canadians for climate change.- Developing heat alert and response systems to protect health.- Supporting heat-health adaptation through proactive communication and outreach.- Health Canada's heat-health education and outreach approach.- CASE STUDY- Harmonizing heat-health messaging in Ontario.- Testing HARS to increase community preparedness for extreme heat events.- Health Canada's efforts to support heat-health preparedness through table-top exercises.- CASE STUDY - Extreme heat and health table-top exercise in the City of Winnipeg, Manitoba.- Preventative approach to building heat resiliency by modifying the built environment.- Development of information and tools at Health Canada to mitigate the urban heat island.- CASE STUDY - Measures to reduce the urban heat island effect in Windsor, Ontario.- Multi-sector collaboration on heat-health adaptation to achieve health co-benefits.- CASE STUDY -Toolkit for increasing the resiliency of health care facilities to climate change impacts including extreme heat events.- Lessons for supporting heat-health adaptation and building resiliency to other climate change impacts.- Addressing vulnerability factors for effective heat-health adaptation.